It’s hard to say who likes the nursing home visits more: the therapy dogs or the residents. From the hands eagerly petting the soft coats to the tails banging against the floor, it’s safe to say everyone’s for it. As part of National Senior Pet Month, we’re switching it up to focus on the dogs that help our country’s senior citizens. Even if the grandkids come to visit, it’s never quite enough for those seniors living in nursing homes. Visiting therapy dogs can help ease feelings of loneliness and lift the spirits. Since most dogs are equal-opportunity lovers, they’ll park their muzzles on the nearest knee, nuzzle into palms and provide unconditional love to anyone with a soft lap and open arms. 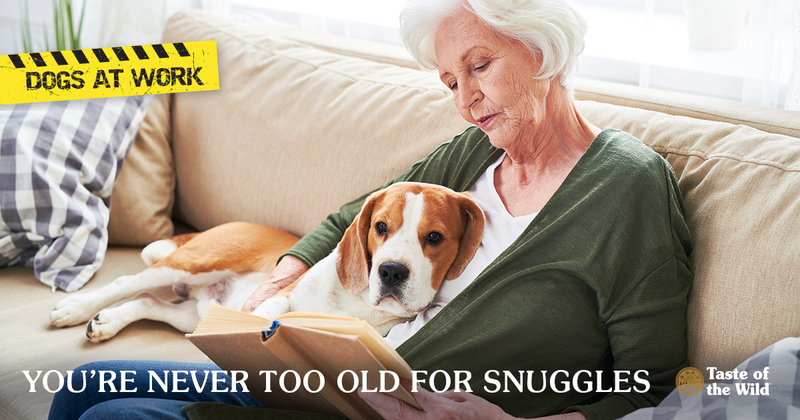 Many seniors may have lost their spouses, or they simply miss having a dog snuggled next to them in bed. For them, visiting dogs help fulfill the simple need to touch and be touched. Dogs can also help reduce anxiety, provide comfort and even promote social interaction among other seniors. Although therapy dogs provide a service to nursing homes, they’re not the same as service dogs. Service dogs are specifically trained to make it easier for people with disabilities to perform activities of daily living. A service dog might help a person who is visually impaired to navigate the streets. Another might retrieve objects for someone who has mobility problems. As service dogs, they are protected under the Americans with Disabilities Act (ADA), which entitles them to accompany their handlers anywhere in public. Although they may be around people, most handlers have a “no petting” policy so the pups aren’t distracted from the job at hand. With therapeutic visitation dogs, on the other paw, petting is generally welcomed. Most of these dogs are family pets with calm and gentle people-loving personalities. They can be purebred dogs or mutts. Their job is generally to provide comfort and psychological therapy to people other than their handlers, such as residents in nursing homes, hospitals and more. Therapy dogs usually go through some training, but it’s not as extensive as service-dog training. And they are not protected under the ADA, so there may be limits to where they can go. Think your pup has what it takes to visit nursing homes? While therapy dogs can be trained by almost anyone, most programs usually require that dogs have at least passed the American Kennel Club’s Canine Good Citizen Test. In addition, volunteer dogs may be required to be certified and registered for a program. Therapy Dogs International, for example, is an organization that has registered around 25,000 dog/handler teams across all 50 state of the US. The dog must pass a temperament evaluation and have a current health record. Because nursing home residents can have compromised immune systems, it’s also important that volunteer dogs are healthy and current on vaccines and parasite control. Owners may also be required to carry liability insurance. For many volunteers and their pets, it’s a fulfilling activity to do with their dogs. And occasionally, humans return the favor. At dog nursing homes across the country, people are caring for senior pets who need a home where they can live out the rest of their lives. It seems we all get by with a little help as we age.